Three of the most popular and sought after apocryphal books are now presented in a single volume. The Book of Enoch is quoted by Jude, cited by Peter, and read by the apostles, Enoch (1 Enoch) informs our ideas of angels and demons. The book describes the fall of a group of angels called the Watchers, who took the daughters of men as wives and fathered the Nephilim (Genesis 6: 1-2). Enoch goes on to record amazing visions of heaven and the workings thereof. Enoch is an ancient Jewish religious work, traditionally ascribed to Enoch, the great-grandfather of Noah. It is regarded as canonical by the Ethiopian Orthodox Church. The Book of Jubilees, also known as The Little Genesis and The Apocalypse of Moses, opens with an extraordinary claim of authorship. It is attributed to the very hand of Moses; penned while he was on Mount Sinai, as an angel of God dictated to him regarding those events that transpired from the beginning of the world. The story is written from the viewpoint of the angel and takes place after the exodus of the children of Israel out of Egypt. The setting is atop Mount Sinai, where Moses was summoned by God. The text then unfolds as the angel reveals heaven's viewpoint of history. We are led through the creation of man, Adam's fall from grace, the union of fallen angels and earthly women, the birth of demonic offspring, the cleansing of the earth by flood, and the astonishing claim that man's very nature was somehow changed, bringing about a man with less sinful qualities than his antediluvian counterpart. The story goes on to fill in many details in Israel's history, ending at the point in time when the dictation began on the mount. 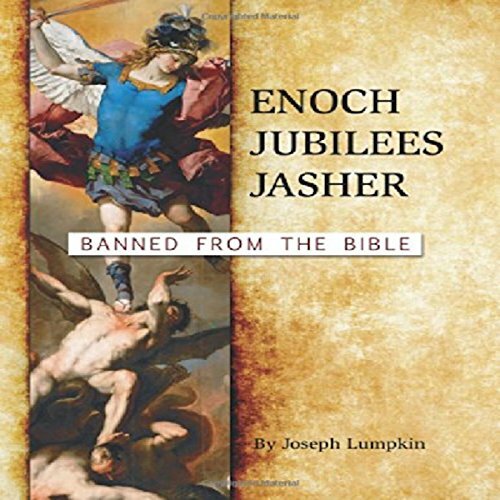 The Book of Jasher reveals a large quantity of additional information about the period between divine creation and the time of Joshua's leadership over Israel when the Israelites enter into the land of Canaan. Was a very good read. surprised this was taken out of the Bible, it explained on a lot of unanswered questions. I increase the speed of the speech just a tad, but I have no complaints whatsoever, it was not read in a boring voice, and it kept my attention. but the end is the same Jesus ! Never order an audio book without a track list! so annoyed! Should get a refund! Superb reading and comprehensible accent. The narration is of neutral tone, pleasing pitch, and consistent mood. You'd be better off purchasing the separate books than this one. I'd go with Ken Johnson's books. At least the narration and reading is cohesive. This one by Lumpkin jumps about in the narration, from book to book and is hard to follow. Also there is no chapter track in this one. The narration is also not very good. Dennis Logan sounds like he is narrating a spooky or horror book. Thumbs down on this one. Having all three books together in one place sounded like a great idea to me but the books and chapters are all intertwined together and he bounces back and forth from one to the other, not in any particular order that I can tell. One minute it's clear that you're in the book of 1 Enoch and the next thing you know, you're in a chapter of Jasher. Chapter 9, kept repeating "codex corrupted" every few seconds over and over again during play. It was annoying. There was also inserted audio in places with a different sounding voice and speed. I've only gotten through chapter 21. At chapter 10, the audio said it was chapter 7. Most chapters are listed different than the audio. Confusing. I see that some complained about the voice. I agree that it can seem somewhat creepy at times, especially when there is other audio inserted at chapter headings. It is a slower speed with a deeper pitch. Considering that the downloaded book comes to 260 chapters, it will be a nightmare trying to get through this. I was really hoping for better. I purchased it last night and I'm already wishing I could get my money back. The guy's voice is creepy sounding. There is constant commentary throughout the books. Thumbs down.